I found THIS on Chupa's blog via Pinterest, and was completely inspired. 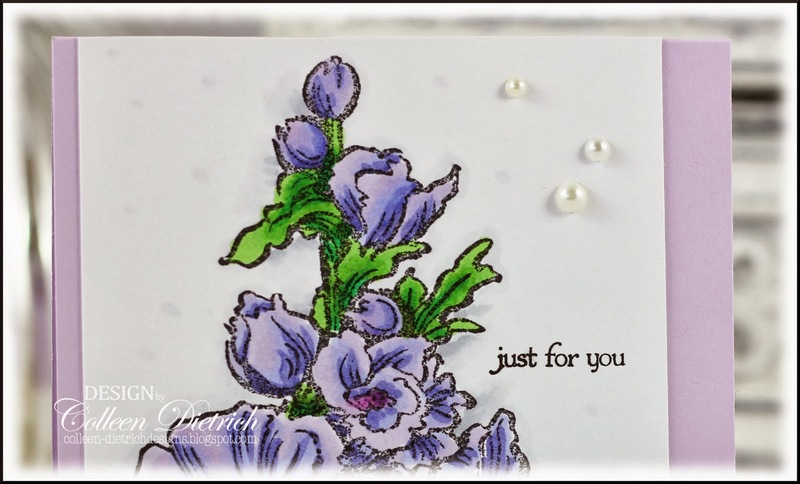 I was having a difficult time figuring out how to use this Jumbo Hollyhock stamp by Stampendous, and her creation totally wowed me. Since the stamp is so large, keeping everything simple is key. And using amazing marker colors helps to add such interest. A little sentiment from SU's Teeny Tiny Wishes and some pearls were added, and that's it. Thanks for letting me share this with you today! Stamps: Jumbo Hollyhock -Stampendous; Teeny Tiny Wishes - SU Paper: Pale Plum - SU; white - PTI Ink: Memento Tuxedo Black - Tsukineko Accessories & Tools: Copic markers; pearls - Queen & Co. Stunning card! Love the image and colors. Absolutely gorgeous !! such a beautiful card Colleen! the flower stamp is so stunning and beautifully coloured! Sooooooo gorgeous! LOVING the colors!!!!! You have done an amazing job Colleen! This is beautiful and your signature pearls look perfect! Beautiful, Colleen. The colors are yummy and made for a wonderful card. I love hollyhocks! Remind me of my grandfather's garden, and have tried many times, but just can't seem to keep my plants healthy-looking, so I'm always looking for a good stamp to reproduce them. Love your card today, Colleen. I'm waiting for a new Penny black Hollyhock stamp to arrive, which is a little smaller scale. Beautiful flowers and just the right touch of pearls! Simplicity works beautifully for this, Colleen! It couldn't be more gorgeous. Fabulous coloring, and I love how you set the image panel slightly to the side. The pearls and tiny sentiment are perfect! What a beautiful card. And I LOVE your coloring. Lovely and I really like how you mounted your floral too! 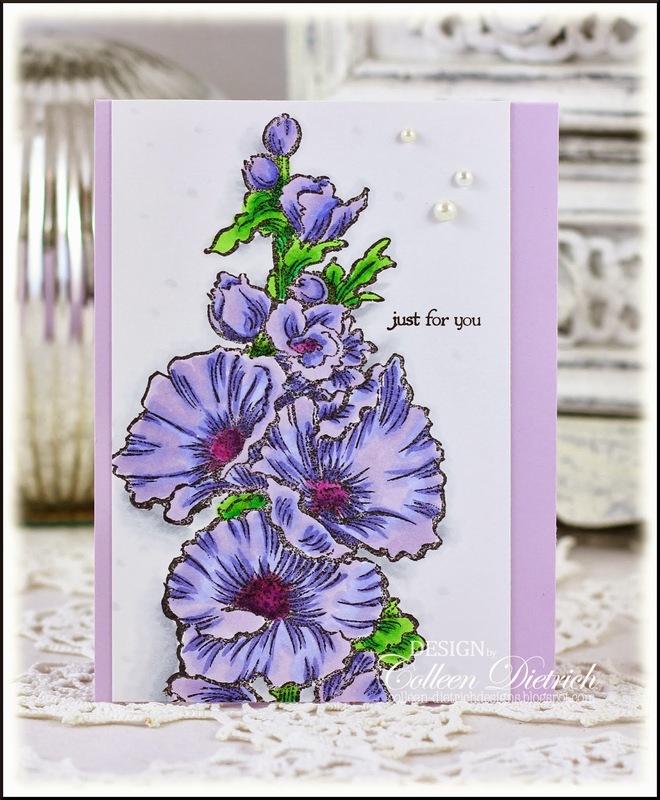 Oh my Colleen thisis gorgeous; love the shades of lilacs and your coloring is amazing! Gorgeous! I love the small scale of the sentiment paired with this huge flower spray.